I’ve grown up on and around boats my whole life and I have driven anything between 13 and 40 feet, inboard and outboards, dinghies, deck boats, and towboats. The best memories have been from our towboat, a 2008 X2 MasterCraft. The interesting part of that, is how we as a family helped shape the future of towboats on Big Rideau Lake. See, ours was was the first of 188 (used and new) MasterCrafts Len’s Cove Marina has sold to date. This is thanks in large part to my Dad who went up to Sean back in 2008 wanting a towboat for his kids. When my Dad first went up to Sean talking to him about his vision of Nic (my brother) and I being able to grow up doing various water sports, Sean thought differently about a towboat. His thinking centered around us getting a bow rider or a deckboat with a wake board tower on it for various (some good, and others misguided reasons). While my dad appreciated the advice, he held off thinking that he wanted a towboat with an inboard motor. Ironically, a few weeks later another customer talked to Sean wanting a similar experience… and this got his mind thinking. Was he off base with his thoughts on "ski boats", and was this the right time to jump into that niche? As it turns out, a "towboat buyer" is by-in-large a planner by nature, and often is looking ahead at what boating is ahead for them. The research began and Len's Cove was struggling with the decision of which brand (Nautique, MasterCraft, or Malibu). At that time, there were no dealers in Eastern Ontario for any towboats, so we really could make any choice we wanted. January 2009 came along and so did the Toronto Boat and Sportsman Show. After spending hours pouring over all the brands, and talking to each rep some things became clear pretty quickly. MasterCraft and Nautique were hard brands to obtain, and both of them required extensive application processes. This seemed daunting, and may have lead Len's Cove to picking an easier brand instead, as the goal was to display the new line 6 weeks later at the Ottawa Boat Show. The connection that made the fit seem natural with MasterCraft boats was the respect that Sean had for Buckeye Marine in Bobcaygeon Ontario. That dealership served as a roll model for many and the fact that they carried MasterCraft carried a lot of weight. Conversely, having Buckeye be able to recommend Len's Cove, was an enormous advantage that tipped the balance in the favour of us getting the dealership quickly. Len’s Cove Marina Signed with MasterCraft and became the only dealer in Eastern Ontario only one week after the Toronto Boat Show and had 6 boats on display at Ottawa. My mom and dad walked into the show in Ottawa, and bought one of the first from Sean. Since then my family and I have experience all kinds of water sports, my favourite being Wake Surfing. We spend time going out cruising around the lake, and enjoying our summers even more. I love being able to take the boat out on my own with my friends, explore the lake, soak up the sun, and pass on my passion for the water down to my friends by teaching them what I love. It's actually hard to imagine what turns our summers may have taken if we hadn't pushed Sean to make this move. Would the timing not have worked, would they have towboats at all, would it be MasterCraft, would I have met the same people, would we still be on Big Rideau....who knows? 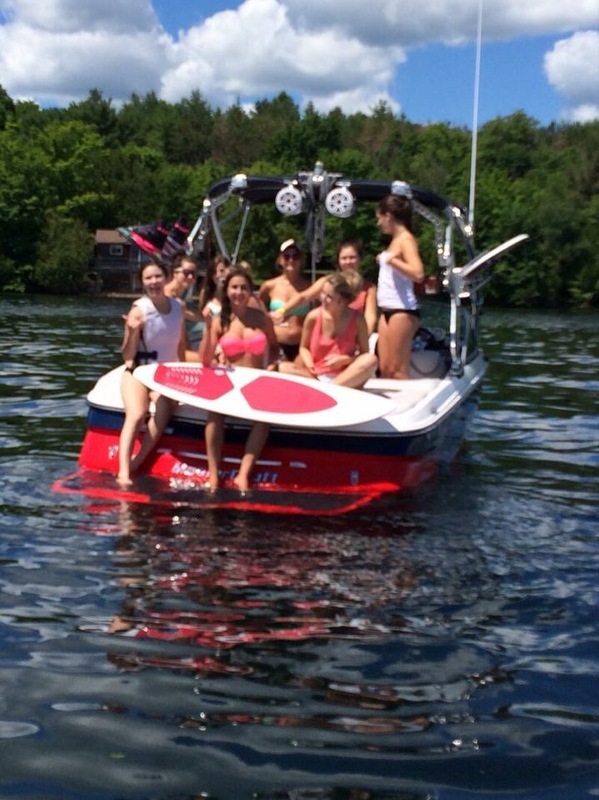 Thanks to Len’s Cove and MasterCraft, my summer days have been fantastic with my family and friends and I am glad I do not need to answer those questions. If you want more information, please contact us directly, or check out the MasterCraft Boats resource page at this link here.